“Aural-Performance, Conceptual Blending, and Intertextuality: The (Non-)Use of Scripture in Luke 24.45-48.” Pages 180-200 in Biblical Interpretation in Early Christian Gospels Volume 3: The Gospel of Luke. Edited by Thomas R. Hatina. LNTS 376. London: T&T Clark, 2010. Drawing on cognitive linguistic theories of conceptual blending, Frederick Tappenden explores the hermeneutical implications of the absence of scripture in Lk. 24.45-48. Specifically focusing on aural-performative dimensions of 1st century C.E. 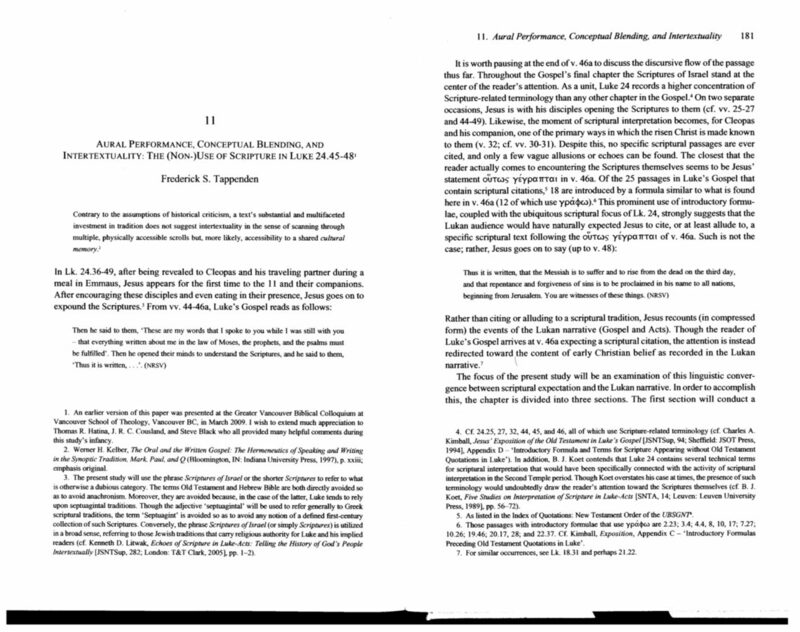 reading practices, Tappenden argues that 24.45-48 (re)produces a conceptual structure wherein the scriptures of Israel are blended with the events of the Lukan narrative. It is argued that this blend is continually reinforced throughout the ongoing aural performance of both the scriptures and Luke’s gospel. This is facilitated largely by the style of Luke’s writing; as Luke’s reading communities continually hear the events of Jesus’ life performed with scriptural overtones, the blend is continually elaborated through the implicit intertextuality of the gospel’s septuagintal style. The result is the development of a distinct hermeneutical mind-set, one that is both ‘cognitively grounded at the individual level’ and ‘socially enacted at the cultural level’ (being continually prompted by ongoing aural-performative reading-events). In this way, the conceptual blend created in Lk. 24.45-48 enables sustained communal identity not only across reading events (i.e., from synagogue to ecclesia) but also across Christian communities (i.e., from ecclesia to ecclesia).